The King's German Legion (KGL) was a British Army unit of mostly expatriate German personnel during the period 1803–16. The Legion achieved the distinction of being the only German force to fight without interruption against the French during the Napoleonic Wars. The Legion was formed within months of the dissolution of the Electorate of Hanover in 1803 and constituted as a mixed corps by the end of 1803. Although The Legion never fought autonomously and remained a part of the British Army during the Napoleonic Wars (1804–15), it played a vital role in several campaigns, most notably the Walcheren Campaign, the Peninsular War, and the Hundred Days (1815). The Legion was disbanded in 1816. Although the Legion never fought autonomously, its units participated in campaigns in Hanover, Pomerania, Copenhagen and Walcheren, the Peninsular War under General Sir John Moore; and the retreat to Corunna; the Peninsular Campaign under the Duke of Wellington, including the battles of Bussaco, Barrosa, Fuentes de Onoro, Albuera, Ciudad Rodrigo, Salamanca, Garcia Hernandez, Burgos, Venta del Pozo, Vittoria, San Sebastian, Nivelle, Orthez, Sicily and the eastern parts of Spain, Northern Germany and Göhrde. In the Peninsular Campaign, the Germans enhanced the veteran core of the British army. At Sabugal, in April 1811, several hundred German hussars augmented the Light Division, and the Hussars found the proper ford of the Coa River. At the Battle of Garcia Hernandez, the Dragoons performed the unusual feat of smashing two French square formations in a matter of minutes. At the Battle of Waterloo, the 2nd Light Battalion with members of the 1st Light Battalion and the 5th Line Battalion, defended the farmhouse and road at "La Haye Sainte." As the 5th Line Battalion under Oberst Ompteda was on its way to reinforce the defenders of Haye Sainte, the French cavalry attached to Jean-Baptiste Drouet, Comte d'Erlon's Corp I rode them down; only a few of the intended relievers survived. After a six-hour defence, without ammunition, or reinforcements, the Germans were forced to abandon the farm, leaving the buildings in shambles and their dead behind. After the occupation of Hanover by Napoleonic troops the Convention of Artlenburg, also called the Convention of the Elbe, was signed on 5 July 1803 and formally dissolved the Electorate of Hanover. Consequently, the Elector's army was disbanded. 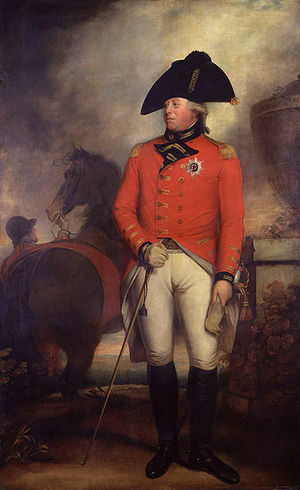 Many former Hanoverian officers and soldiers fled the French occupation of Hanover to Britain; George III, the deposed Elector of Hanover, was also King of the United Kingdom. The same year, Major Colin Halkett and Colonel Johann Friedrich von der Decken were issued warrants to raise a corps of light infantry, to be named "The King's German Regiment". On 19 December 1803, Halkett's and von der Decken's levies were combined as a basis of a mixed corps (includes all arms: mounted, infantry, artillery) renamed the King's German Legion. The KGL infantry were quartered in Bexhill-on-Sea and the cavalry in Weymouth, Dorset. Some units were involved in a street fight in Tullamore, Ireland with a British Light infantry unit in the so-called Battle of Tullamore. The number of Officers and Other Ranks grew over time to approximately 14,000, but during the 13 years of its existence, close to 28,000 men served in the Legion at one time or another. Initially, most of the officers were appointed with temporary rank, but in 1812 all the officers of the Legion were given permanent rank in the British Army for 'having so frequently distinguished themselves against the enemy. It saw active service as an integral part of the British Army from 1805–1816, after which its units were disbanded. The Legion was known for its excellent discipline and fighting ability. The cavalry was reputed to be among the best in the British army.According to the historian Alessandro Barbero, the King's German Legion "had such a high degree of professionalism that it was considered equal in every way to the best British units. After the victory at Waterloo, the Electorate of Hanover was re-founded as the Kingdom of Hanover. However, the army of Hanover had been reconstituted even before the final battle, so that there were two Hanoverian armies in existence. 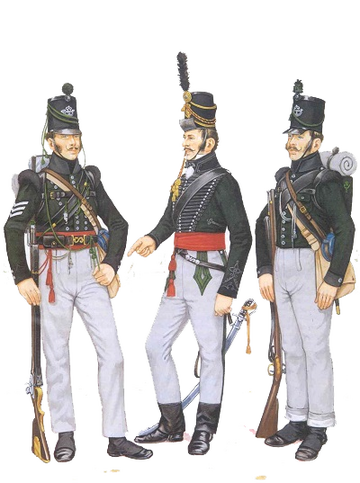 In 1816 the Legion was dissolved and some officers and men were integrated into the new Hanoverian army. The thread got even better, nice job Charles and good luck once again. Thanks all.... We are actively recruiting from within both the HF & NW communities. We will only recruit from within game, so make yourself known to a [1st L KGL] member, play awhile and chat about accepting the Kings Shilling. Hi, I'm new in the 1st L KGL. I'm glad to join you! Welcome Kommodore, we hope to see you in TS over the new few weeks.